Don’t you feel sorry for 11-year-old Barron Trump? No, I’m not talking about being upbraided by the Tucker Carlson-founded Daily Caller for dressing like a kid instead of a Cabinet member. I’m talking about in six or eight years. Imagine Barron in 12th-grade American History class, when the teacher covers the key points about our 45th president who 1) historians unanimously consider the absolute worst U.S. president ever, 2) was forced out of office within a year of inauguration to avoid Russian collusion and obstruction of justice convictions, 3) set race and gender relations back decades, 4) embarrassed America for several years on the world stage, and 5) secured Richard Nixon’s status as the second most corrupt president ever to serve. Sure, Barron will be wealthy beyond belief, but he will have to live down his family legacy for the rest of his life. Now there’s a juxtaposition: a lifetime of riches alongside a lifetime of shame. Don Jr., Ivanka, and Eric have been complicit and should share in the disgrace. But young Barron has no choice. I feel bad for him. Let’s hope Melania puts a little more effort into that campaign to fight cyberbullying. 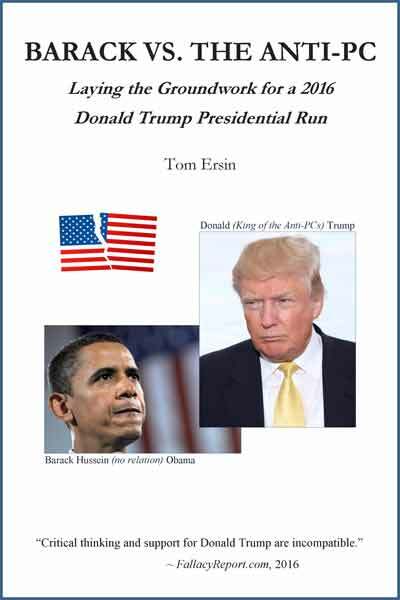 The Donald has two settings: Teleprompter Trump and Wing-It Trump (Jennifer Rubin of The Washington Post calls the latter “Crazy Trump”). 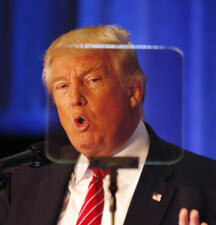 Teleprompter Trump speaks in complete sentences, with little veracity or flare. Wing-It Trump speaks in stream-of-consciousness snippets and nuggets, also with little veracity but lots of flare. Wing-It Trump, however, offers an accurate look into his soul. And as anyone who has been paying attention (since before the GOP presidential primaries) knows, it’s not pretty. There was an incredibly clear juxtaposition (good word) of the two Donalds in his appearances over the past two days. On Monday, Teleprompter Trump made a presidential address to the nation outlining his Afghanistan policy. You can always tell Teleprompter Trump by the way he robotically pivots back and forth between his left and right script screens. Can’t this guy take some time away from watching cable news to learn how to use a teleprompter? His eyes are laser-locked on either screen for the allotted three or four sentences each. It’s embarrassing. The Afghanistan address was a hurried event, moved up to draw attention away from his Charlottesville debacle last week, during which he gave cover to Nazis. Aww, I guess that’s not fair — they were neo-Nazis. Pundits have pointed out that Vice President Mike Pence was rushed back early from an overseas trip to attend Trump’s address. If it wasn’t rushed, pundits asked, why didn’t they stick to their originally scheduled day, sometime after Pence’s originally scheduled return home? I’m kidding. Many called it “measured” and “presidential.” But for all the perfume Chief of Staff John Kelly poured over this pig, Trump still got some wing-it-esque nuggets into his speech. He said he’s “a problem-solver.” The military audience’s mental snickering was deafening. He called terrorists “losers” — again. He said, “We will learn from history.” Except that’s one thing Trump doesn’t do. The speechwriters have a sense of irony. Trump also said he’s “studied this problem from every angle.” That’s not speechwriters’ irony. That’s just plain fibbing. If he’s heard (and apparently realized) that decisions are different when one is president, why didn’t he ever consider that before bellowing the myriad stupid policy statements he has made over the last decade, especially while trashing President Obama? Well, he did consider it — but decided to lie instead. He’s known this all along. But the lies made him famous. Teleprompter Trump went on to criticize Obama’s handling of the Iraq-Afghanistan wars, saying he made wrong decisions about things Trump would have done differently. But President Trump also never acknowledges (when lying) that conditions, and knowledge of conditions, change over time. Trump said he “inherited a mess.” Donald loves to say he inherited a mess from Obama. But let’s stop spraying perfume on this pig: Donald Trump is neither intellectually nor emotionally fit to carry Barack Obama’s golf shoes. Wing-It Trump was a hoot last night at his campaign rally. That hog washed off all of John Kelly’s Chanel No. 5 and reverted to — Jennifer Rubin’s words, not mine — Crazy Trump. He undid any good will he might have established at Monday night’s Afghanistan address. Wing-It Trump defended his Charlottesville remarks by misquoting his own press conference statements, blaming the media (for reporting his words and actions), and, once again, propping up his false equivalent, neo-Nazi-comforting spin. He bashed Arizona’s two GOP senators, one a war hero with brain cancer — while in Phoenix — even though they could be the only thing standing between him and an early, disgraceful White House exit (let alone, getting any legislation done). He proactively annoyed Senate Majority Leader Mitch McConnell (R-Ky.). Apparently, Mitch has not done enough to protect the president from the Russian collusion investigation. Wing-It Trump also threatened to shut down the government if Congress doesn’t give him his Mexican border wall money. He did NOT mention murdered anti-Nazi protester Heather Heyer nor the 10 U.S. Navy sailors killed this past week. Donald performed most of his Greatest Hits, but even some Trumpites are becoming tired of the rhetorical reruns: For the first time in Donald Trump’s political career, the failing New York Times, low-rated CNN, and other assorted dishonest fake news outlets reported that people began leaving early. Little Katy Tur, Little George Stephanopoulos, and Little Marco had no comment. Otherwise, a good time was had by all. Overall, most Americans, including many Republicans, thought Wing-It Trump’s 77-minute circus of a rally on Tuesday was an incompetent, immature, narcissistic mess compared with Monday’s (barely) competent, serious, robotic, prompter-licious reading of a speech written by his generals. It was classic wing-it vs. teleprompter (Ah, let’s go for three) juxtaposition.